Two 1966 Ford GT40 Mark 1 road cars are among the highlights of the 2016 RM Sotheby’s Monterey classic car auctions. Only 50 Ford GT40s were ever built with 31 destined for road use while the racing cars famously won Le Mans in 1966 (and the following three years). The 1966 Ford GT40 Mk I, chassis no. P/1057 (Est. $3,250,000 – $3,750,000) and the 1966 Ford GT40 Mk I, chassis no. P/1061, (Est. $3,750,000 – $4,250,000) are both in restored condition and comes with full histories. Ferrari had long-dominated the racetrack, and after a failed bid to acquire the Italian manufacturer, Ford’s desire to dethrone the vaunted Scuderia was only heightened. Ford did just that in 1966, with the Ford GT40 campaigned by none other than Shelby American claiming victory at Le Mans – the first of four consecutive victory years for Ford GT40s at the world’s premier 24-hour race. When the GT40 entered Mark I production, 50 examples were required to meet FIA homologation, 31 of which were destined for the street. Two of these will be on offer at the RM Sotheby’s sale in Monterey on August 19 & 20, 2016. The most-expensive Ford (and American car) ever sold at public auction was a 1968 Ford GT40 Lightweight, chassis P/1074 that won its debut race at Spa and later served as camera car for the Steve McQueen “Le Mans” movie. It sold for $11,000,000 at the RM Auctions Monterey sale in 2012. The 1966 Ford GT40 Mk I, chassis no. P/1057 (Est. $3,250,000 – $3,750,000) was born a road car and has remained so ever since, though the specification implies little drop-off in performance from its racing siblings. 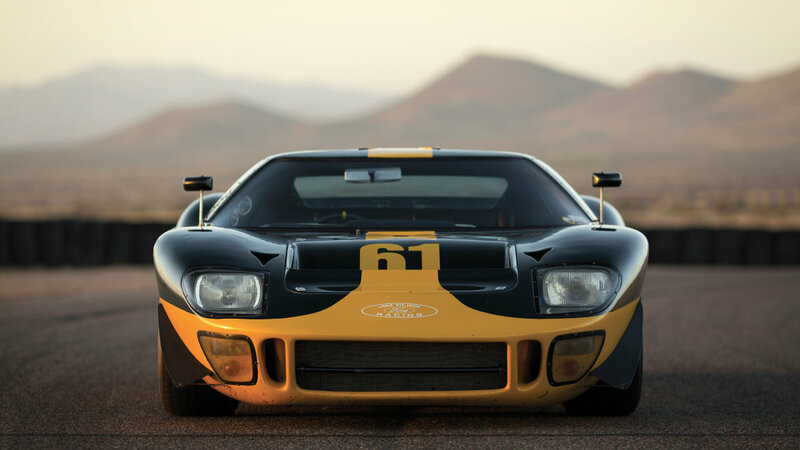 Elevating its rarity, the featured GT40 was one of 20 cars allocated to Ford’s Promotion and Disposal Program when new, and one of seven road cars consigned to Shelby American for retail. Originally sold to Nick Nero of Kansas City, Missouri, P/1057 spent the better part of its first decade as a daily driver under a handful of private owners, before entering hibernation in the early 1970s. In 1984, the car was acquired by well-known and highly respected GT40 restorer Robert Ash, who undertook a thorough, exacting restoration, right down to cleaning up the factory-issued hoses and spark-plug wires, and reconditioning the original carburetors and unusual competition-style 180-degree crossover exhaust. After appearances at several niche events, P/1057 was sold to its current gentleman owner in 1991, and has since been carefully maintained as part of one of the most astute collections in the U.S., the vendor thoroughly enjoying using the car as it was intended—on the open road. With single ownership for the past 25 years and having never been offered publicly, this exceptional GT40 comes to Monterey recently serviced for continued roadworthiness, including a rebuild of its original engine. Also slated for RM’s Monterey podium is the 1966 Ford GT40 Mk I, chassis no. P/1061, (Est. $3,750,000 – $4,250,000) a highlight of the Click Collection for over two decades. One of just 31 Mark I road cars, the featured GT40 was one of seven retained for promotional use by Ford’s merchandising department – a role that saw it take to the road and used by the company’s Southeast Regional Sales district in 1967 as part of dealership displays, auto shows and demonstration laps at SCCA events. At the end of its time on the display circuit, P/1061 passed through a well-documented chain of enthusiast owners, including noted Australian racing driver, Bib Stillwell, before landing with Jim Click in 1992. In the years since, Mr. Click has actively raced P/1061 across the country where it has proven an excellent competitor, including at such venues as Laguna Seca, Riverside and Palm Springs.